If you are anything like me. you have piles and piles of fabric – some of it long lengths, some are small. They are all adding up and I need a more creative way to store them. I started to bundle up some scraps last week (by colour) for a series of patchwork kimonos I’m working on, and had the idea to make bundle boxes for my work table, so that I can just dig inside for fabric when I am at the overlocker, piecing them together. So today, I’m going to show you how to make your very own fabric boxes! They are very easy to make, and you can keep anything in them. I think I am going to make a ton for the playroom for those pesky legos that I keep standing on. 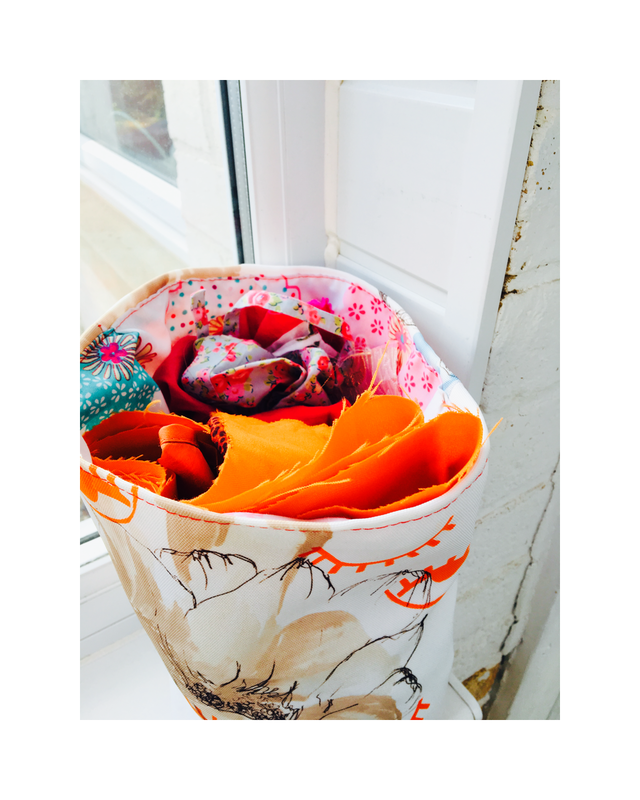 Fabric Scraps – a mix of any for the outside, but for the inside lining I’d go for a sturdy fabric, upholstery scraps work well. 1. Decide how big you want your storage boxes to be – I want a range of sizes, and will make the smaller size to begin with. Measure 3 inches in from each corner – and draw a square to connect the marks, cut out the square from each corner – leaving seam allowance. Then match the bottom edge with the side seam as shown – and sew along the line you drew to close. Do the same on the other side and repeat for the lining. 6. Flip the right way out by using the hole you left open with the lining and press along the top edge; then sew closed the bottom edge that you left open. Press then top stitch along the top edge for a neater finish. All done! You are now ready to start filling your new box with all sorts of treats! Happy sewing! If you have enjoyed this post please comment below and let me know of any other tutorials you would like me to share!